Welcome to 6912 Williamsgate Blvd, a stunning, 2.5-year-old home in the Williamsgate neighborhood. This 1.5 story home in Crestwood is an original Ball Homes product is a modified “Jackson” plan with plenty of upgrades. 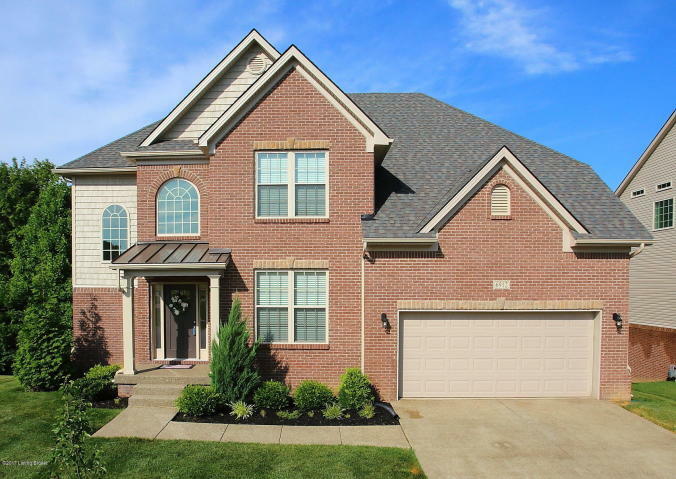 In this home, you will find 5 bedrooms and 3 full baths, plus an unfinished walkout basement with roughed in full bath, which is ready for you to design as you please. 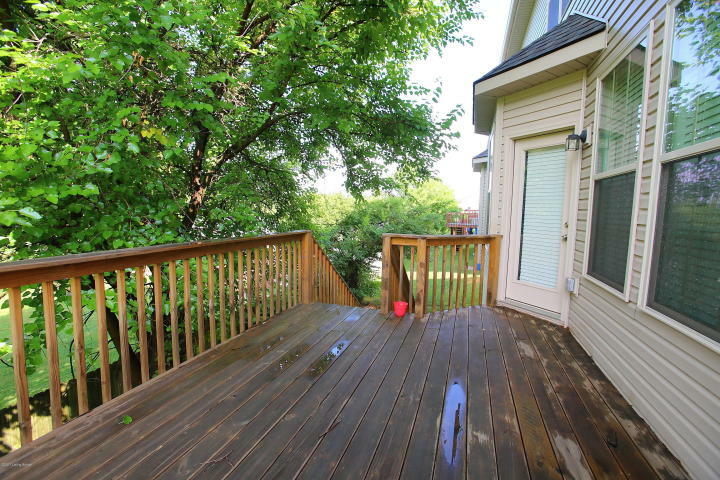 On the front of the home, you will notice the well-kept landscaping and lush green lawn. Enter this home and you are greeted with 2800 finished square feet. The two-story foyer includes stylish hand scraped dark hardwood floors that are also found throughout the whole home. To the right of the foyer is the dining room. 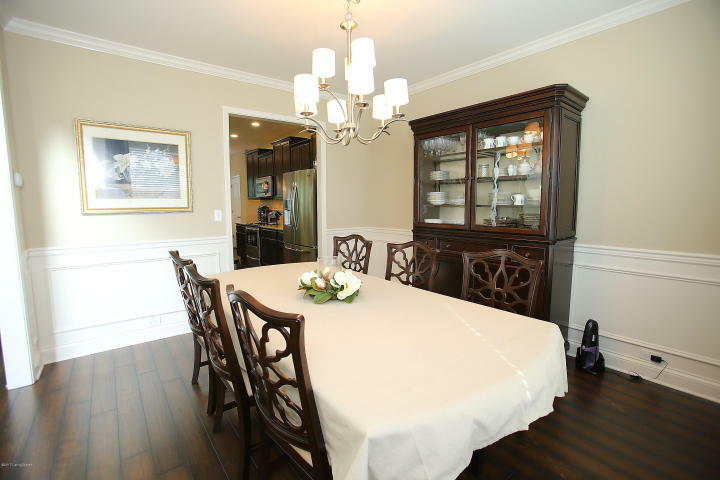 The dining room includes wainscoting, chair rail, crown molding, and a chic chandelier. There is a doorway to enter the eat-in kitchen from the dining room. The kitchen is huge and boasts extensive cabinetry, granite counter tops, stainless steel appliances (which all stay with the home), a pantry, can lighting, and a large eating area with door to the private, over-sized wood deck. 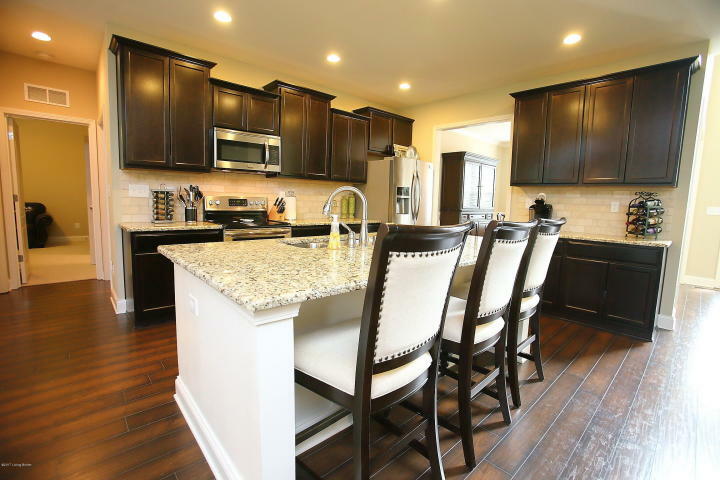 The island in the kitchen has space for bar stools for an additional eating area. The kitchen opens to the expansive great room with corner updated fireplace with stone surround, wood mantle, and a ceiling fan. The openness between the kitchen and great room creates an ideal space for entertaining a large group. Through the other side of the kitchen, you will find a laundry room and a mudroom, complete with custom-built cubby with 8 coat hooks and lots of storage compartments. On the right rear of this home is a first-floor bedroom with large window, walk-in closet, and access to the full bathroom with ceramic tile floor, and granite counter tops on the vanity. Moving to the open 2-story stairway to the second level, notice the lovely handrail with gorgeous iron spindles. On the second floor, you will find 3 additional bedrooms with carpeted floors, 2 with large closets and the third with a walk-in closet and double windows in each bedroom. The second floor has a full bath with ceramic tile floors, linen closet and a granite topped vanity. The catwalk overlooks the 2-story foyer with views out the front of the home. Down the hallway, you pass a linen closet as you proceed into an amazing owner's suite. 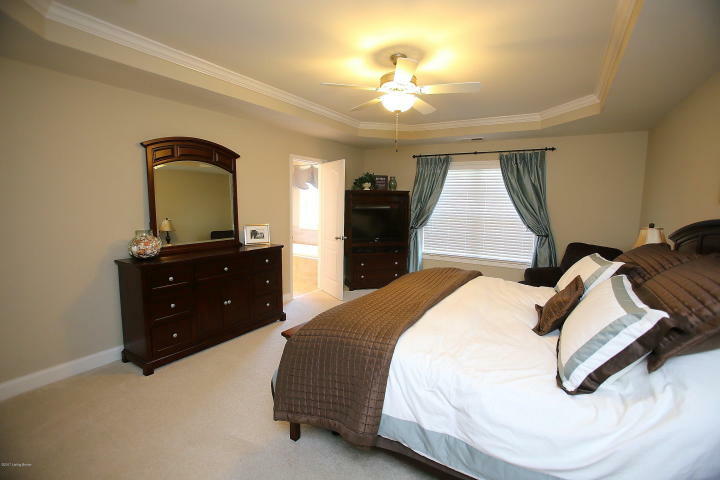 This 5th bedroom is very large and has plenty of room for a sitting area looking out the double windows. 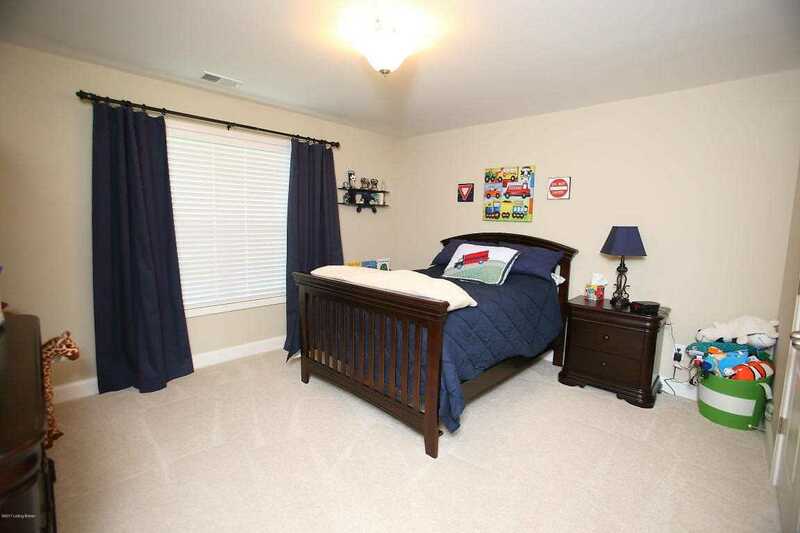 This room has carpet, a trey ceiling with ceiling fan and crown molding. Off the owner's bedroom is the owner's bathroom. It includes ceramic tile floors, 2 large granite topped vanities, (1 has a makeup desk), a 6-foot garden tub, a huge ceramic tile shower, linen closet, toilet room, and a huge walk-in closet. In the backyard, the new owners will enjoy the tree lined lot, providing ample shade on hot days. This home also includes 2 HVAC systems and a passive radon mitigation system is already installed. For more information on this exquisite home in Williamsgate, contact the Hollinden Team at (502) 429-3866.